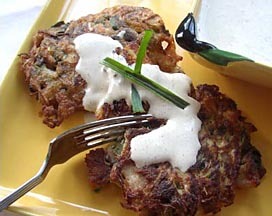 Recipe for Low-Carb Egg Foo Yung with Ginger Mustard Sauce. This is great way to use that leftover chicken breast and pork chop. Heat a small amount of peanut oil in a large pan and stir fry vegetables just until heated through. Add meat and continue to stir fry until it's all heated through. Remove from pan to a colander to drain excess juices. Set aside.